For my task i am going to look at common conventions within horror films. I am researching horror films as i plan on making on making a opening to a horror film for my course. Horror is an ancient art form as people have aimed to scare each other through stories and other art forms for thousands of years. Audiences willingly offer themselves up to sadistic storytellers to be scared and they are happy to pay for the privilege. This is where the horror industry was born. One of the first of the horror films was the golem, which was broadcasted in the 1915/1920. In this era they weren’t called horror films they were called monster films. And the settings normally were about 16th century. Another film which is as well know as golem which is known as the daddy of all horror films is called ‘the cabinet or Dr Caligari’. Also another popular horror film is Frankenstein (1910), which is very well, known and also this is another film like the others that has doctors as main characters.
. Wes Craven - craven Is perhaps one of the most iconic and well known horror directors/ writers of all time creating the nightmare on Elm street and Scream franchises almost effortlessly. Craven has also been responsible for many remakes of films and has also directed the hills have eyes and the last house on the left. Craven has been directing films for well over 30 years.
. George A. Romero - George basically invented the modern zombie film which has been copied hundreds of times over. George Romero is responsible for the living dead franchise which has lasted over 40 years from the original night of the living dead in 1968 too survivor of the dead in 2010.
. Tobe Hooper- Tobe Hooper created the Texas Chainsaw massacre. When The Texas Chainsaw Massacre came out in 1974, it was a total horror game changer. Nobody had seen anything so honest or believable before. This style of horror had never been done before and it invented the verite style of horror, creating copycats into perpetuity. Hooper is also responsible for the poltergeist franchise. I have chose to do this collage as it shows many horror conventions in action as well as many examples of horror films and things you will expect to see in horror films. I have chosen to include a chainsaw as many films such as hostel and the Texas chainsaw massacre use chainsaws. This is because the sound and appearance as well as the possible damage that a chainsaw can cause is terrifying. I have also chose to include a picture of rain and night, this is because many horror films take place on rainy nights. The reason for this is people feel more scared when something's set at night time as its harder to see the villain and areas are typically more abandoned. The rain acts as a distraction during scenes and as many actors fall over in horror films it creates an excuse for this and as well as night it restricts view. I have included a picture of blood, this is because this is perhaps the most common convention of horror films as every time an actor is hurt or murdered a lot of blood is used to show this. I have a picture of a knife, this is because this is the most common type of murder weapon that is used in horror films. This is because its a widely available weapon and the idea of someone going mad with a knife is very scary as it has happened in real life. I have a picture of the mask from Friday 13th, this is because it is an example of a scary mask and as many scary masks are used in horror films it is a good example of this. The reason masks are used is because they hide the killers identity and expressions, this adds to the mystery of the story and makes the viewer want to find out and guess who the killer is. I have a blonde female screaming in my collage, this is because this is the stereo-typical damsel in distress/ victim in horror films, although this rule has been turned around with the girl being the hero in many recent films. I also have a picture of a group of zombies, from the film resident evil, the reason i have included this picture is because recently zombie films have become more and more popular nowadays. The main reason many zombie films are being made lately is they are quite easy to write a script for as they have rather simple story lines. Although all horror films are different many of them follow a similar formula, and have similar story lines. Most horror films begin with seemingly ordinary people in their ordinary lives, this could be a group of school children. These people are usually happy and theres an equilibrium at the start. This is then followed by some sort of villain/ monster emerging, this person will then become the focus of movie, this killer will usually emerge due to a murder being reported on the news. the film then shows this killer picking off the group of "ordinary people" one by one until there is one or two left (usually a couple.) These two are then usually chased where they save each other over and over again until they find a way to escape or stop the murderer. However the ending of a horror is usually mysterious to leave a way for the villain to come back. Usually all of these characters except the villain are teenagers which are aged between 16 and 20. A reason for this could be that it attracts the target audience because the target audience for many films is !6-25 as many horror films are 18's due to their nature. The mise-en-scene is basically whats in the scene. This could include costumes, lighting and props but as ive talked about these areas already i feel its pointless to go through it again.
. Villain - Outdated old clothes, a mask and their clothes are usualy stained with the blood from their victims as well as dirt. A mask is often to use to hide the villains identity from the victims and the audience, also this adds a sense of mystery as you carnt see the killers expressions so it makes them more unpredictable. Obviously all of these films are very different but they share many of the same horror conventions. Opening conventions of horror films. Many horror films have the same or at least similar conventions, for example most horror film openings are set at night time and have dark lighting. This is to create a gloomy atmosphere and to put the audience on edge. Openings for horror films must hook and engage the audience and make them want to carry on watching. A opening scene of a horror film usually has a death of some sorts, this is to make the audience want to find out who the killer is why they killed the victim and how they are gonna get caught. Establishing shots are usually used to set the setting and date. This may show a gloomy woods like in the shining for example. Music is also used in openings for horror films, this is used to build tension and to give hints to the kind of genre that the film is going to be. Horror films tend to use non-diagetic sounds to unease the audience. Font type and color is also important for example saw films use red text with blood imagery of the font, this font type suggests a horror film due to the presence of blood. I am going to do a nine frame story board on a horror film, this will detail camera angles, techniques and other interesting points about the frames shown. The film i am choosing to do this on is Resident evil, as i think this is a very good example of a horror film and i believe it is very well made. This shot is a medium panning shot with special effects added. This shot has a slow motion section which shows that its important. Throughout this shot there isnt much sound except for when this vial containing the virus hits the table and smashes. The lighting in this shot is harshly bright as its in a laboratory and laboratory's are always well lit. This kinda lighting however also shows that the shot is important and you must pay attention to it. This shot shows the man being took prisoner. This shot makes you want to know what hes done what, hes being arrested for and basically what his story is. This shot appears to be a low angle mid shot. This could show that the man is a good character as the camera and therefore the viewer are looking up at him. In this shot you can hear a lot of the characters talking over each other, this combined with the flashing lights confuses the audience and makes them want to know whats happening. This is a long shot showing the use of blood as a prop. There is a lot of fake blood shown in the shot, this is because it will please lovers of gore, which the corpse will please as well. This shot shows the survivors walking towards the train and the blood. this suggests as blood can represent as blood shows danger, the characters are walking into danger. Throughout this scene metallic sounds and clanging can be heard. This is to unease the audience as they want to find out what the sound is. This is a high angle shot looking down on the characters. This shot looks like its from a cctv camera in the attached to the ceiling this suggests their being watched and makes the audience wonder whose watching them and why. The shot has dark lighting which is common among many horror films and red lights can be seen everywhere which suggests danger and blood and therefore violence. This is an over the shoulder shot showing the man looking at the large group of zombies. This shot looks similar to the kind of shot you would expect to see in a video game, i think the reason the shot is done in the way that it is is because the film is based on a video game and this links the two formats together. The zombies look slightly out of focus which could imply they are unimportant characters. whereas the man and the crate on the right are in Focus as they are essential to the story line and have large roles in the film as the crate contains a zombie hybrid. This shot is a close-up showing this characters expression. You can clearly see he is injured and upset in the shot. He is looking down from the camera, this could suggest the characters ashamed, upset or reflecting on his past. This is a high angle shot and the camera is looking down on him which suggests hes done something wrong and the audience are almost looking down on him. This shot is a low angle shot looking up on the main character this suggests that shes a hero type character as the audience are looking up to her. she is looking down on another character which shows she is superior, this is siggests she is more important and superior to the other character. This is an aerial shot which shows the extent of the damage to Racoon city. This is an important shot as it sets the film up for a sequel. This shot is designed to show the extent of the damage and to show how abandoned the city is. Alice is in the center of this shot as she is the center of attention and the shot is focused on her. Eerie incidental music to build up the tension, the wind can also be heard. This poster is effective for advertising the film as it immediately suggests horror. The reds used in the poster could represent blood or danger which would both be appropriate to the film. The red also mixes with the yellow on the poster to make a fire effect. The poster also contains a collage of images from the film, these show the scenes from the killers child hood in the film and this suggests that these memories of his have made him the killer he is today. The villain can be seen carrying a knife, this suggests that the film is going to be a slasher and that the knife is his weapon. The poster also shows him walking in the open and as he has his mask in his hand this suggests hes proud of who he is as hes not hiding his face in the picture. Also this shows this film is going to be different to normal horror films as you know the identity of the killer straight away. A old abandoned looking house can be seen on the poster, this suggests that this is where the killings in the film will take place as abandoned old areas are usually used. The colour of the font used for Halloween looks scary as it looks like it it on fire with the way the red and the yellow mix together. The tittle is much bigger than the other font suggesting its the most important text on the page and its also in capitals to make it stand out. The villains mask is in his hand this suggests that he's just killed someone and hes done with it or he's on his way to kill someone. This poster shows the main character from the film, she is very scared at this point. This is shown by her having her hand over he mouth like she has just saw something she didn't want to see or she is shocked or grossed out by something. Also her eyes are enlarged and her pupils are dilated to show that she's seen something that has horrified her and that she is scared. this suggests straight away that the film is going to be scary. Her face is also very pale this could show that she feels sick from what she is witnessing or that shes scared.Also you get a old fashioned feeling to this poster because is it in black and white which shows you it is either an old fashioned film or the poster should only give you that impression. As the film is in the time of coloured t.v and fairly modern compared to other horror films i believe this is used to show that it is an old traditional horror and they are going to follow the rules of horror films.The picture is a used effectively because they have used the whole of the image well by cropping the picture so only the face will show and fill all the space on the screen this makes you wonder why is this character so important. They have used an old simple type of font for this poster to show again that this film is an old type of film and an old type of plot to the film which is commonly used. However the M in the word scream has a pointed edge, this could suggest that this is a slasher and that a sharp object such as a knife is the murder weapon which is the case. However i think the choice of font colour is poor as its white text on a white background making it hard to read and meaning it doesn't stand out as much as it could do. 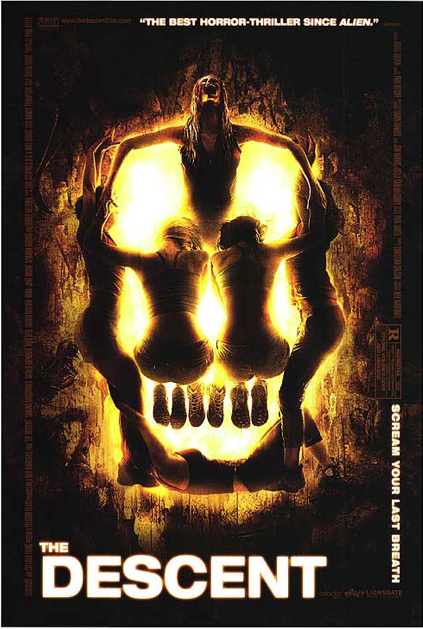 This poster is extremely effective the body’s are all placed in a specific place to make them look like a skull this is a very clever poster in the way that it has been done and i think it works effectively. The reference to Alien is massive using such a historic and famous film to relate your film too people will immediately see this then want to see it as the film that it has been related to is so famous. The slogan scream your last great i think is very effective to it has a strange sound to it it is quite disturbing. The girl at the top looks like she is in pain and the rest of them look dead overall i think that this is one of the best horror movie posters that i have ever seen it is so clever and in my opinion really done well i also love the way that all of this has been linked in to the movie there are six girls in this and in the movie the story is of six girls and at the end only one survives so really it all links in. I feel that the use of dark colours on the poster could represent the dark lighting that is used in the film and the yellow in the center represents a light. Another thing that i found out when i further researched this poster was that, this is a very famous image as this is image of deaths face that is a very old portrait that the man below made it was ten used for the bee on the poster and front cover of the silence of the lambs which is very famous and now it has been recreated and used in the poster for the decent. 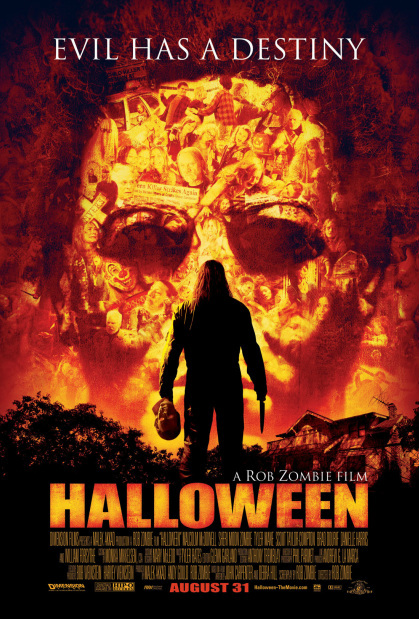 This is the font used for the Halloween film poster. It works effectively as the capital letters make it stand out. The colour of the font is scary as it looks like fire or it looks like blood is splattered on it the way the red mixes with the yellow. The font of this looks sharp and sinister. The use of roman numerals instead of numbers works well as the V looks sharp and a lot more sinister than a simple number 5 also this is unusual so it sets the film out form others slightly. The font is a contrast to the background as the font is over a section of blood on the background. This font works very cleverly as they have used a 4 instead of an A in the film title as they look similar meaning people can still read it as scream. The 4 is in red making it stand out and also red is used a lot in horror films as its the colour of blood. The white font might be used to represent ghost face's mask from the film. This would explain the black background as ghost faces costume is black. This is a sans serif font meaning it is easy to read. This writing to me looks dreamy and bright which represents the film as during the film really harsh and bright lighting is used which makes the film look like its a dream, the idea of this is to create a sort of purgatory feel. The writing is out of line this looks like its been painted by a child which could represent the villain in the film who is a child. The tittle for this film is much bigger than the rest of the text on the poster, this makes it stand out much more compared to the other text. White font is used i believe this is used to contrast the dark background which could represent the dark lighting and themeing of horror films. The above video shows many screams from horror films, this is an important sound effect as it is needed every time sometime is in pain or scared because this in turn scares the audience and makes them feel sorry for the character. These type of sound effect are designed to unsettle and disturb the audience and to match the scary theme of the film.